This blog is dormant. Long live this blog! This blog was always “occasional”, as it says in the heading – and now it’s going dormant. The reason is that I can not visit Russia … and, try as I do to follow its life from a distance, that gets harder as time passes. I was denied entry to Russia three years ago by the security services, and a few weeks ago, despite having a gold-plated invitation from the “right” sort of people, had a visa application rejected because I am “forbidden to enter Russia” (the embassy’s words). I’m continuing to try to get this decision reversed, but that might take a while. In June 2008, I arrived at Domodedovo airport with a multi-entry visa and was sent straight back to London by the migration service (which answers to the security service, the FSB). The Russian consul in London told me I had been denied entry under a catch-all clause of the law governing who comes and goes that refers to “national security”, “the defence capability of the state”, etc. My guess is that my problem stems from meeting the “wrong” people (who were themselves under surveillance), rather than writing the “wrong” things, although I don’t know. (Pretty much all there is to say about this was said at the time by the Campaign for the Protection of Journalists, who wrote a letter to the president here http://cpj.org/2008/09/cpj-asks-russia-to-allow-journalists-entry.php). 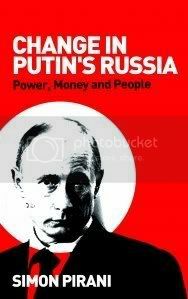 Since then, I have continued, in my work as a researcher and journalist, to follow the Russian economy (and you can see the sort of thing I write on http://www.simonpirani.com or the web site of the Oxford Institute for Energy Studies). But keeping in touch with Russian events in a broader sense is tough. And I’m not sure I can add anything valuable for you, dear reader. If you want to know what’s going on, try some of the links on the right hand side. If you’re wondering how I am, try my other sites. This one will stay live – there’s a fair bit of stuff accumulated on it – but from now on I’ll add to it only rarely, or when my luck changes. Thanks for visiting, anyway! People who speak out against the road project at Khimki, north-west of Moscow, which has attracted massive public opposition, stand a good chance of being savagely beaten by thugs with baseball bats. The attack has incensed Russian public opinion and the president Dmitry Medvedev has called for an urgent investigation. The police will have to improve on their poor record of tracking down journalists’ assailants to convince sceptics, though. No-one knows exactly why Kashin was attacked, of course. His courageous reporting of the pro-Kremlin youth movement Nashi, or of political opposition movements, could be the reason … as could his coverage of the Khimki affair. See his blog here (Russian only) http://www.kommersant.ru/blogs/blog.aspx?blogID=3. Mikhail Beketov, the editor of Khimki’s local newspaper, Khimskaya Pravda, was the victim of a similar attack almost exactly two years ago. There are links to the Khimki campaigners’ web site in the next post down. Journalists across Europe will on Thursday 16 September mark the tenth anniversary of the death of Ukrainian internet journalist Gyorgy Gongadze – a classic example of the impunity of powerful people who instigate violence against journalists. The importance of the campaign to bring those who ordered Gongadze’s killing to justice was grimly underlined in recent weeks by the disappearance, and feared murder, of investigative reporter Vasily Klimentyev in Kharkov on 11 August. The instigators of Gongadze’s murder were at the very top of the Ukrainian political pyramid. Former president Leonid Kuchma, current parliamentary speaker Volodymyr Lytvyn and some of their cronies discussed harming him – shortly before he was kidnapped, beaten, strangled and beheaded by a gang of policemen. The gang leader, Aleksei Pukach, is now awaiting trial, and three of his accomplices are serving prison sentences – but the instigators of the crime have never been brought to justice. The conversations in Kuchma’s office about harming Gongadze are known to the world, because Mykola Melnychenko, a former presidential bodyguard, released tape recordings of them two months after the murder. But the chain of command that led from Kuchma’s office to those who killed Gongadze, founder of the Ukrainska Pravda web site, has – so far – been covered up. Former home affairs minister Yuri Kravchenko – who was apparently assigned during those conversations to have someone sort Gongadze out – died in mysterious circumstances (shot himself in the head twice, allegedly). Two other key internal affairs ministry officials who were probably involved both fell into a mysterious coma and then died. The Ukrainian general prosecutor’s office effectively sabotaged the investigation of how Gongadze’s killing was ordered and organised. It at first denied Gongadze was missing, then mishandled evidence, and for years failed either to follow basic policing procedures or to resist political pressure to cover up for the instigators. After the “Orange revolution” of 2004, many Ukrainians hoped the case would be solved – but it wasn’t, and “Orange” president Viktor Yushchenko pinned medals on prosecutors who obstructed the investigation. The disappearance nearly three weeks ago of Vasily Klimentyev, 67, editor of Novy Stil (New Style), a muckraking local paper in Kharkov, is a sober reminder of the dangers facing journalists who try to expose corruption in high places. Klimentyev disappeared on 11 August, while preparing to publish an article about Stanislav Denisiuk, a senior tax official whose wrongdoing he had previously scrutinised. Four days later Klimentyev’s mobile phone and door keys were found and a murder case opened. The investigation was last week transferred to the internal affairs ministry’s national detective unit, after internal affairs minister Anatoly Mogilev said that “current and former representatives of the law enforcement services” were under suspicion. In the ten years since Gongadze’s murder, Ukrainian media have grown to operate relatively freely – particularly on the internet, where Ukrainska Pravda, the site he founded, is leader among many high-quality news sites. Even TV has a greater variety of reporting than in Russia. But physical threats to journalists, especially those who write about state corruption, are all too common. This weekend Valery Ivanovsky, editor of the Zhitomir-based newspaper Silske Zhittya newspaper, was teargassed and stabbed. * A delegation from the National Union of Journalists of the UK and Irelandwill go to the Ukrainian embassy at 60 Holland Park, London W11 3SJ (nearest tube Holland Park) at 11.0 am on Thursday 16 September. In previous years the delegation has been received by the ambassador. The NUJ has actively participated in the international campaign to bring the instigators of Gongadze’s murder to justice, and in supporting trade union initiatives among Ukrainian journalists, over the last ten years. For more details contact NUJ General Secretary, Jeremy Dear, at the NUJ offices. * A conference is being held in Kyiv on 16 September on the issue of impunity for attacks on journalists, involving Article 19, the IFJ and other press freedom organisations. Ukrainian journalists this week marked the ninth anniversary of the death of Gyorgy Gongadze, founder of the Ukrainska Pravda web site. Gongadze’s killing was one of the former Soviet Union’s most notorious political murders. Two hundred people gathered on Wednesday in central Kyiv with candles. Gongadze was kidnapped in Kyiv on 16 September 2000 by a gang of policemen, taken to woods nearby, beaten, strangled and then beheaded. He probably would have been added to the long list of journalists across the former Soviet Union whose murders remain unsolved and little remarked – except that a couple of months later, a bodyguard of former president Leonid Kuchma put into the public domain tape recordings of Kuchma, current parliamentary speaker Volodymyr Lytvyn and some of their other cronies talking about harming Gongadze. Since then, former home affairs minister Yuri Kravchenko – who was apparently assigned during those conversations to have someone sort Gongadze out – died in mysterious circumstances (shot himself in the head twice, allegedly?! ), and two other key internal affairs officials involved in the chain of command fell into a mysterious coma and then died. The site founded by Gongadze has grown to become Ukraine’s premier on-line news source – a fitting response to murderous methods of state censorship. (It’s here – Ukrainian and Russian only: http://pravda.com.ua/.) Its editor, Olena Prytula and her magnificent team of reporters operate from a small flat in central Kyiv, trouncing competitors with quality reporting. Politicians fear them. Long may that continue. You are currently browsing the archives for the Journalism and media category.